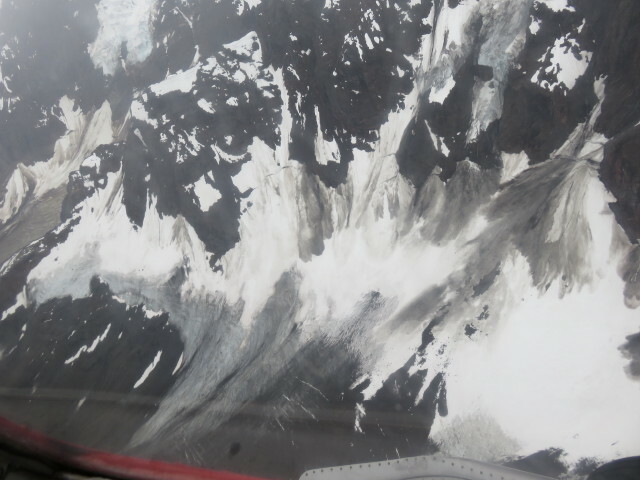 As our flight continued we heard from other pilots that the ceiling near Denali (Mt. McKinley) was around 1,525-1,830m (5-6,000 feet) thus any ability to see the 7,080 m (20,306 foot) peak would not happen on this flight. We asked the pilot about yesterday (when we saw it from the ground). 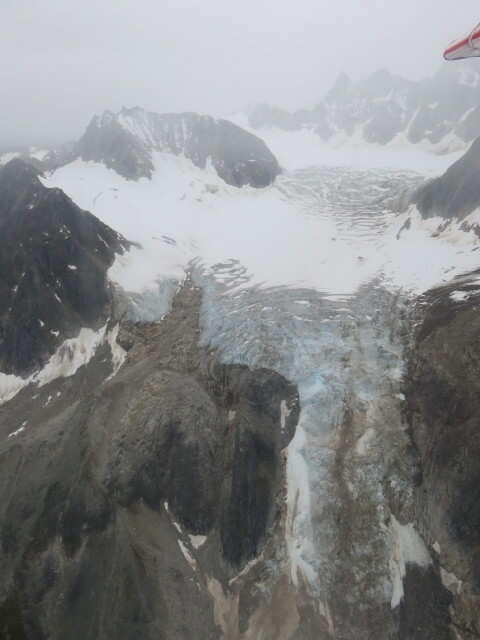 Mike replied that on the 9:00, 11:00, 2:00 and 4:00 flights passengers saw the peak, however by 7:00pm the conditions around the mountain were similar to those we were experiencing on our flight. On the ground the conditions were the same, all afternoon and evening. The first picture in this series makes the point with fresh snow on the mountain tops outside our windows. 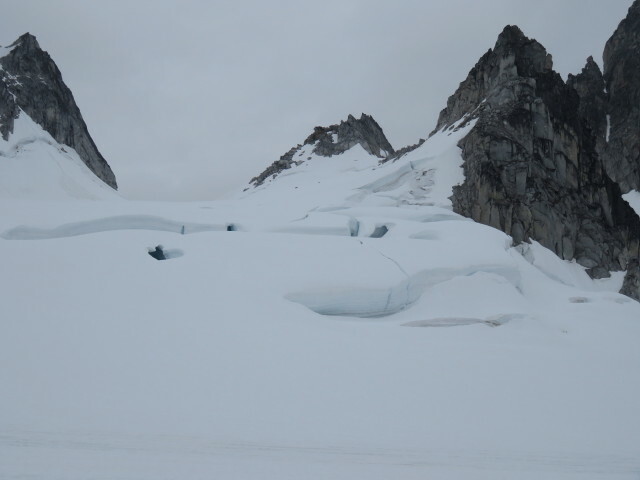 We had a change in plan and had to head towards another glacier since the ceiling was closing in on the planned landing site. 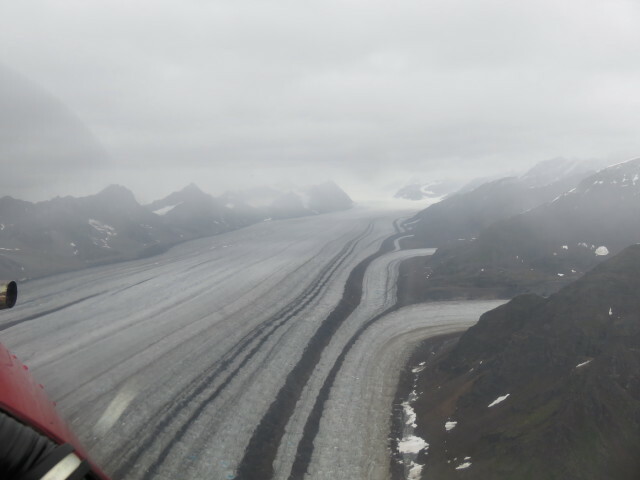 We learned that some of the glaciers we were flying over were about 1.37km (4,500 feet) thick (almost a mile) and that the average ones were 915m (3,000) feet. The deepest depth was just over 1.83km (6,000 feet) in this area. 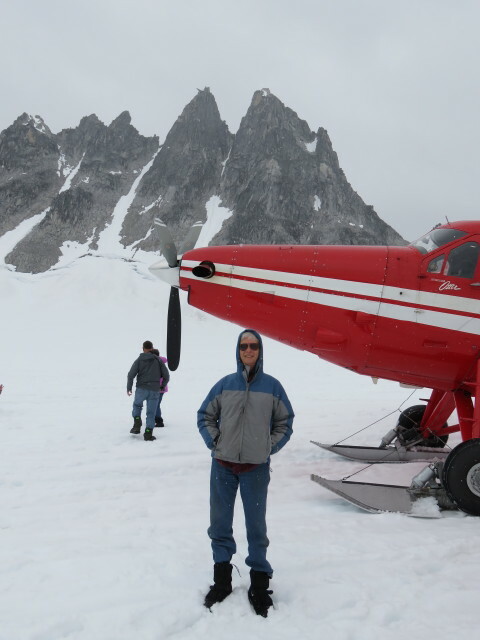 As we approached the new glacier destination we flew up between the mountains and the plane quieted to a very soft purr, during which Mike the pilot pumped a lever that placed the skis under the tires so we could land on skis. A very simple operation carried out in a few seconds. 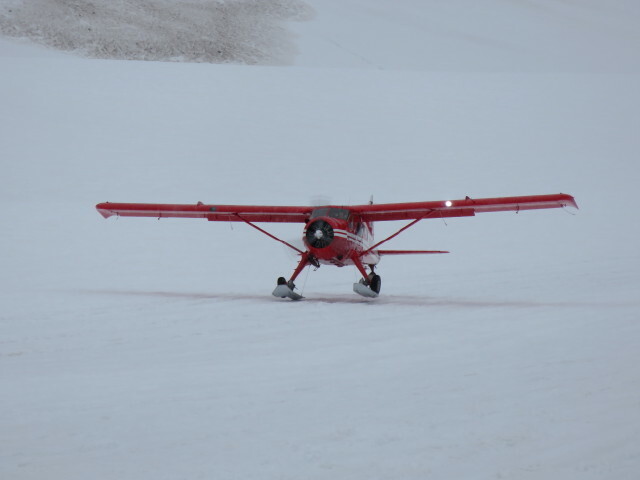 As we reached the upper end of the glacier, we turned around to be down bound to land and take off again and noticed what looked like sleds used by young children set along the side of the landing area to provide a line marking the edge of the "runway”. You can see one in Photo 3 on the far right. We landed very gently and exited onto fresh snow covering 12,000 year old snow. 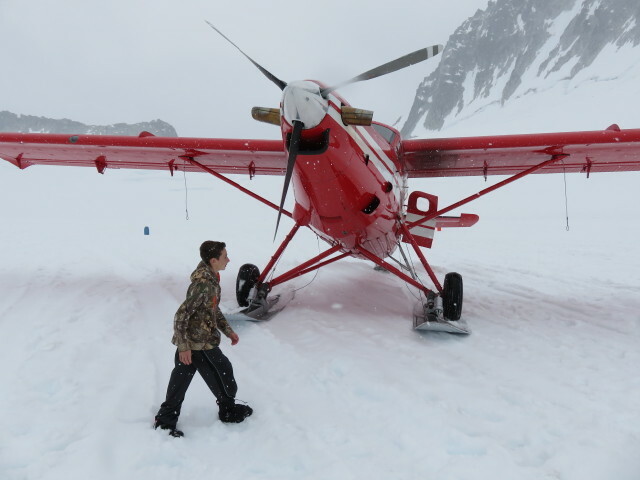 After the requisite snowball tosses we explored near the plane marvelling at the stark contrast between the rock and snow. 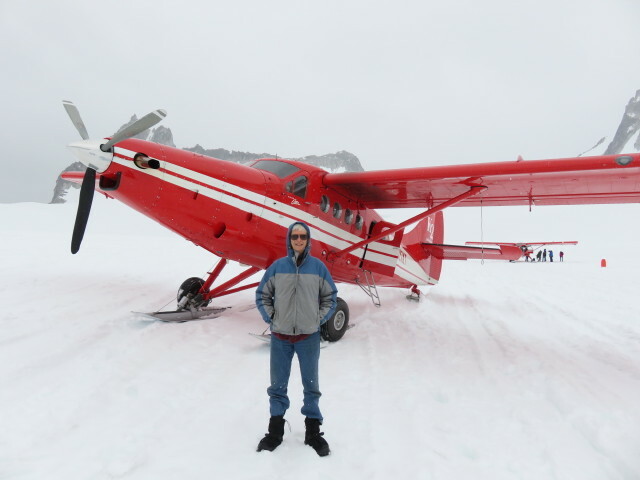 If you look at photo 9 you’ll see the large snowflakes that are contrasted against the red plane and the boy’s pants. It really was snowing a lot more than the picture leads you to believe. We took our seats and I ended up in the co-pilot’s seat, peering out a small side window and the windshield. As we took off the snow hit and melted off the windshield and as speed increased the water droplets slid off to the sides. 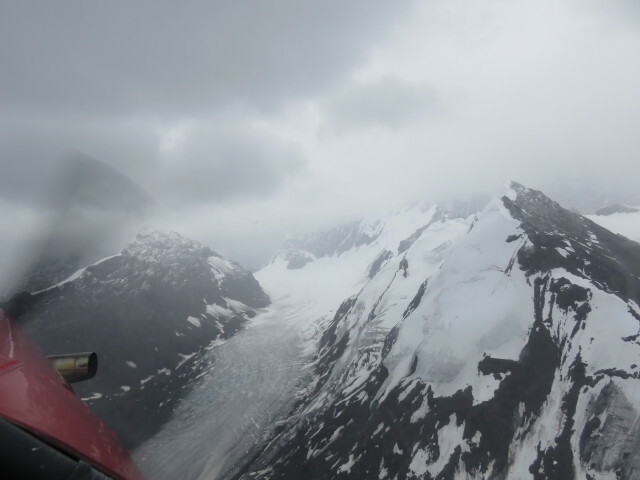 We flew over another neighbouring glacier with the small gateways to valleys between mountains and if you look at the sky in photo 10 you can see that the clouds were dropping around us. We stayed low, flying beside mountaintops to the surprise of the grandfather of the three travelling together. We heard that the second plane also left within minutes of us and both pilots reported to the tower that it would be unwise to allow other planes to land there for the remainder of the day. 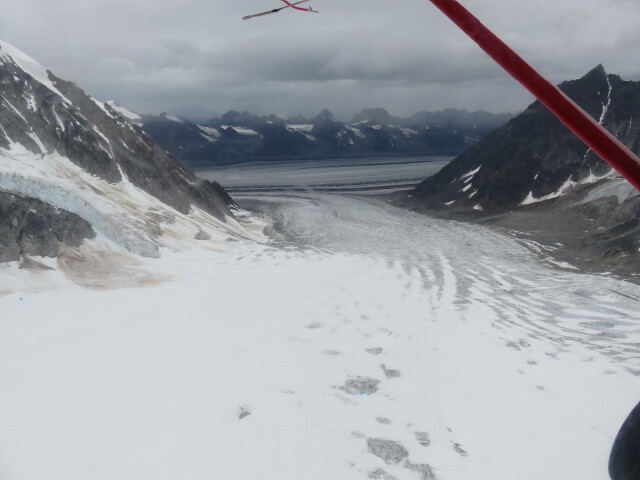 Both exchanged the thought that we would be the only ones landing on the glaciers today. 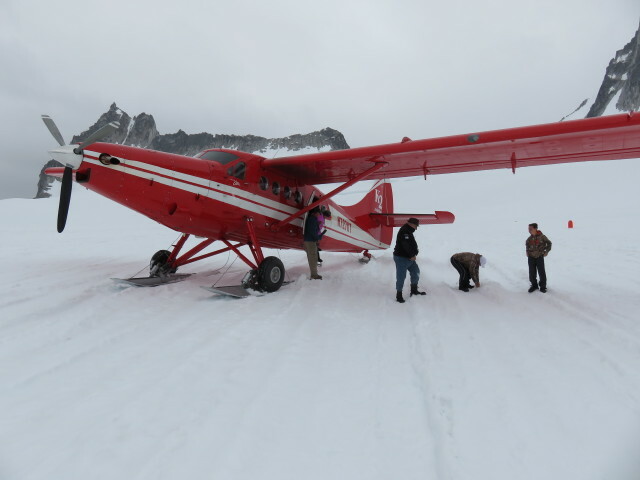 We felt very fortunate to have had the opportunity to land and see, stand on and touch a glacier. 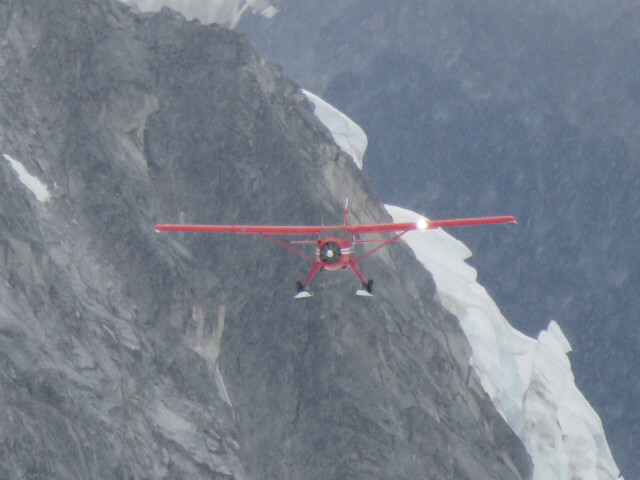 One benefit of flying lower was the great views of the hanging glaciers that literally hang off the rock faces. A superb benefit of sitting "up front” besides watching what a pilot does to fly the plane, (something that always intrigues me) was "HEAT”! It’s cold at the back of a plane! All that comes out of the ventilation system is COLD air. 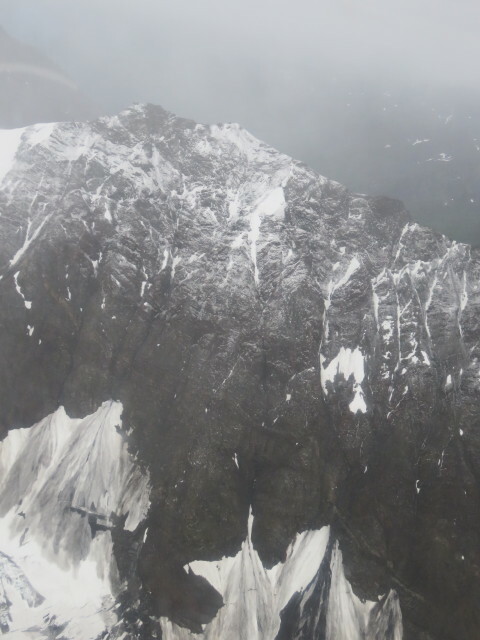 As a result at the heights we were flying [1,525 – 2,286m (5,000 to 7,500 feet)] my hands were very cold. Putting them in my pockets meant I could not take pictures, so the compromise was one at a time. I asked our pilot how long he had been flying (29 years), how long on these flights (9 years with this company) and what does he do in the late September to late April ‘off season’? He responded that he is a native of Hawaii and he returns to that state and flies tourists around the volcanoes in our winter season. He loves his work and he loves flying the Otter aircrafts. We all agreed that he has it all figured out, he loves to fly, can enjoy Alaska in the summer and Hawaii in the winter. That’s sort of the best of both worlds in some people’s opinion. I’ll complete the flight tour in my next message.